Making Hainanese Yi Buah (glutinous rice coconut cake) which is well-loved by my Hainanese husband and his elders. 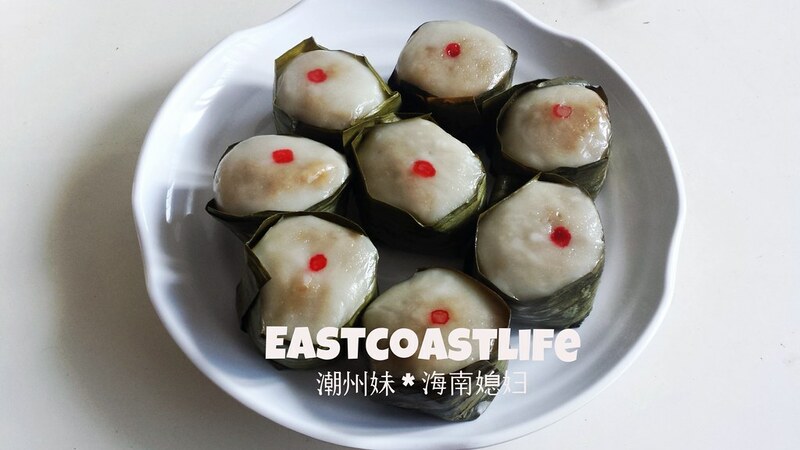 My sister-in-law makes very good yi buah which are popular among the Hainanese community and our clans. I learn how to make yi buah from my sister-in-law so I can make them myself. And whenever my family or friends crave for Hainanese yi buah, I can serve it to them. I made some modifications to my sister-in-law’s recipe. 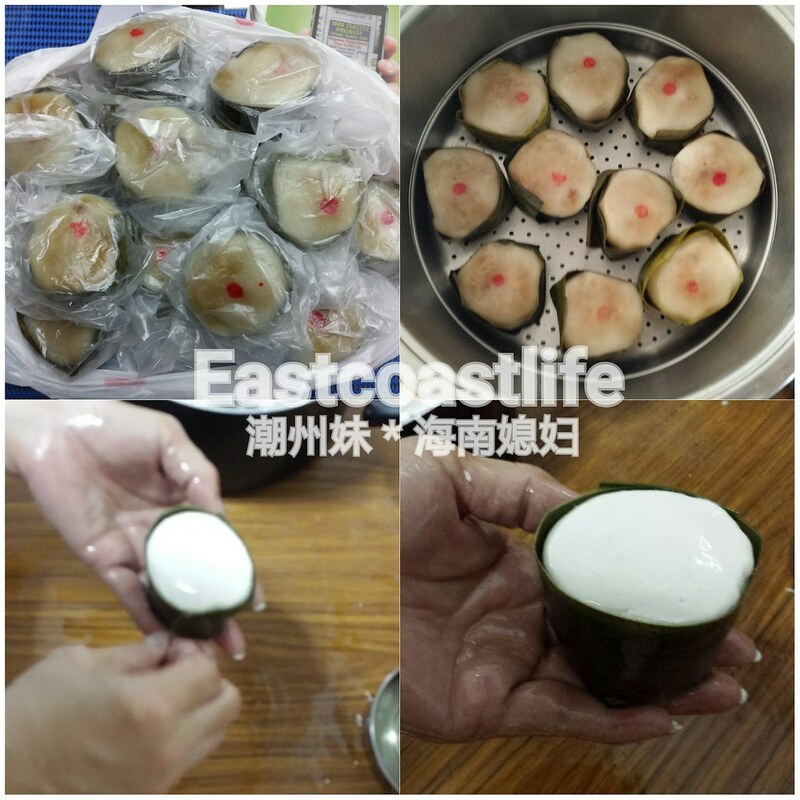 Break gula melaka into smaller pieces, add 1⁄2 cup water and bring to boil, stirring to dissolve the sugar. 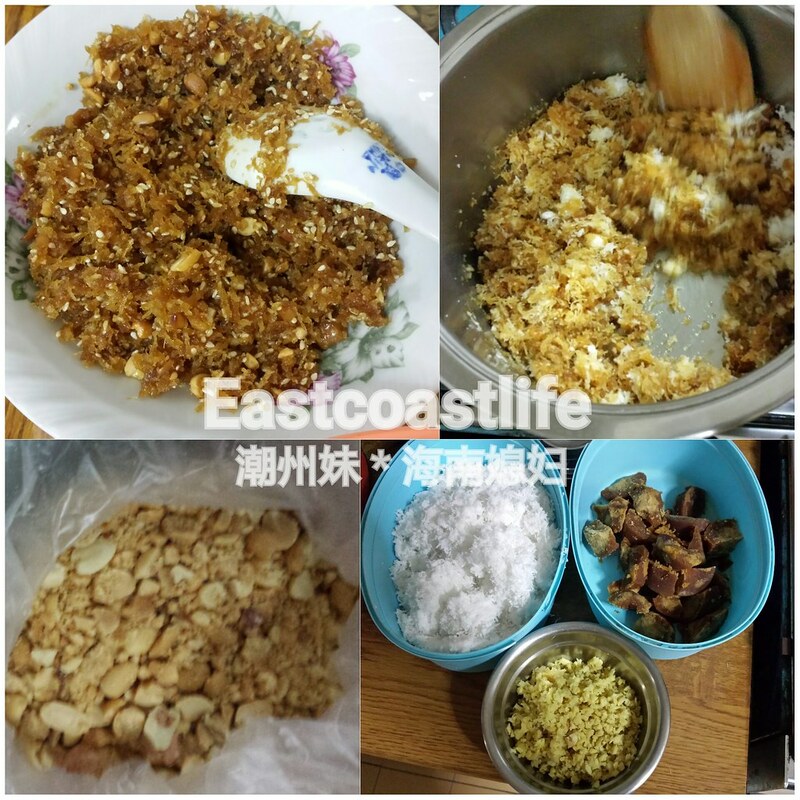 Stir in the coconut, ground peanuts, ginger and diced orange peel. Cook the mixture until well mixed which takes about 5 minutes. Remove the pan from the heat and let the filling cool completely. 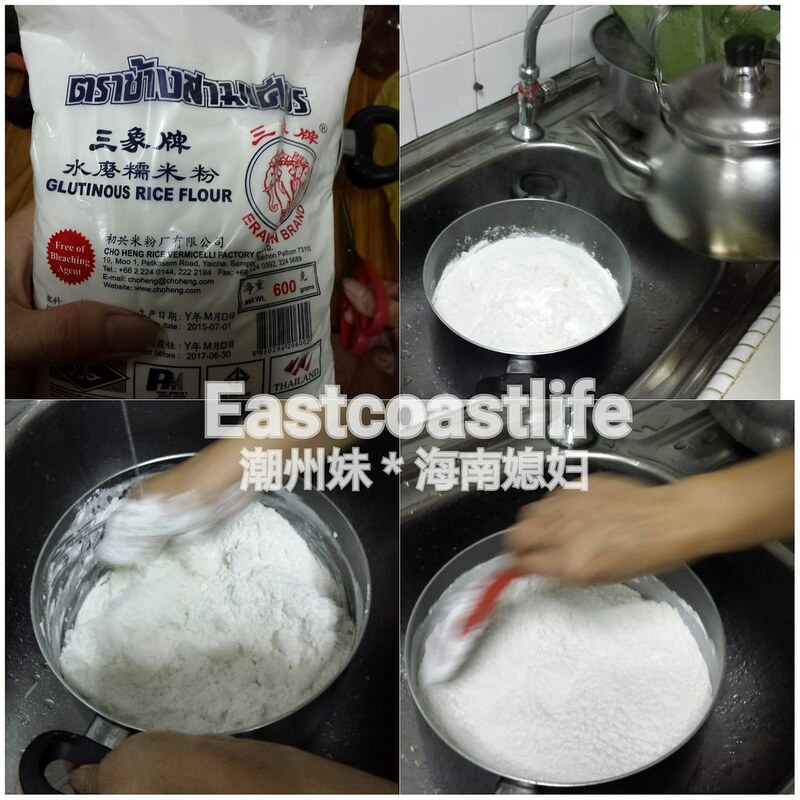 Sieve the rice flour into a large pot before pouring in lukewarm water. Slowly stir until a dough forms. 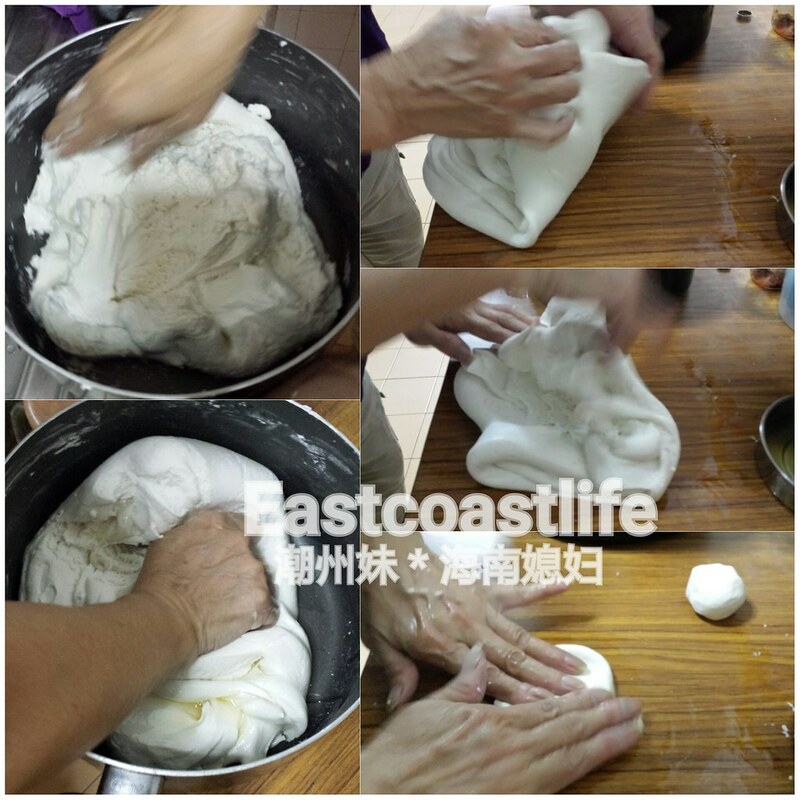 Knead the dough in the bowl until it is smooth and does not stick to the sides of the pot. Cover with cling wrap or wet towel and rest for 20-30 minutes. Divide the dough into balls, depending on how thin the dough you can manage. Cleaned 24 pieces of banana leaves (8 cm strips) and lightly greased with cooking oil. Reserve a few tablespoons of cooking oil for glazing after steaming. Slightly flatten a dough ball, spoon coconut filling in the centre. Close the edges and roll it into a round shape. Wrap a piece of banana leave around the dough. Flattened it slightly and tuck in the folds of the banana leaf. 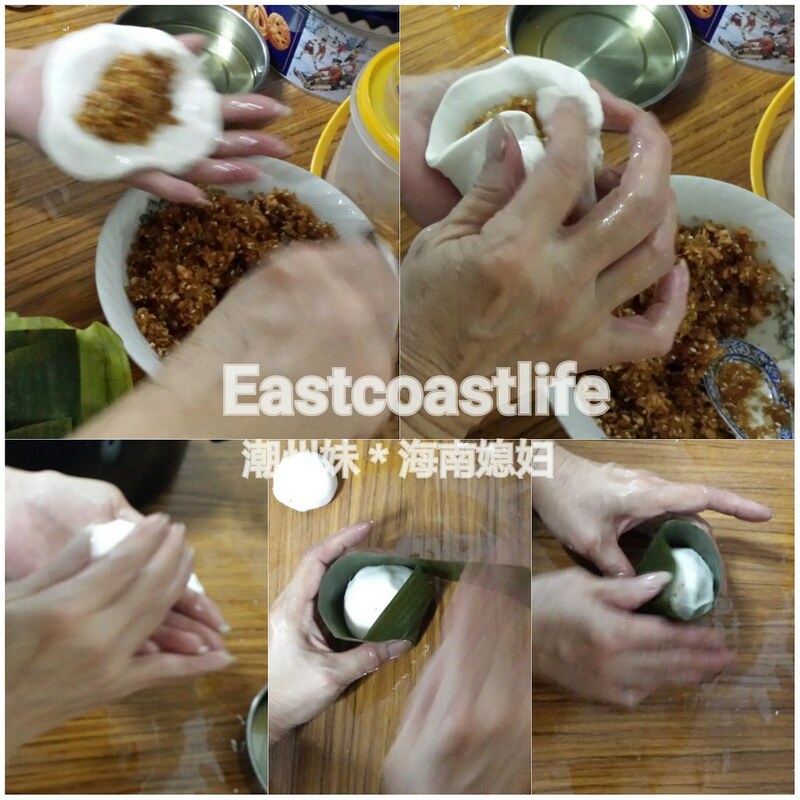 Dust some glutinous rice flour on your hand if the dough is too sticky. Bring 2 cups of water to boil in a rice cooker. Arrange the cakes on a steamer, leave some space between each cake so they don’t stick together. Cover the steamer. Steam the cakes in batches for about 10 minutes. When cakes are cooked, dish onto a plate. Leave it to cool before serving. Dip a chopstick in some permitted red colouring and place a small dot on top of each dough. Brush some cooking oil on the top of the cake while it is warm.